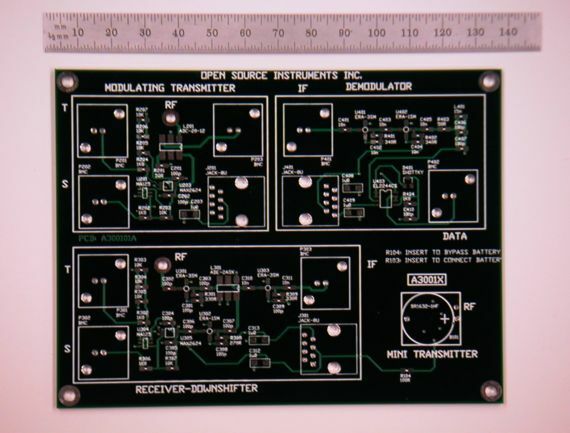 The Miniature Transmitter (A3001D) section of our Rat Transmitter Test Board (A3001) would be 18 mm square and 8 mm high when cut down to its smallest size out of the larger circuit board. The Miniature Transmitter obtains its power from a BR1632 3-V Lithium battery, and drives a MAX2624 VCO directly with the battery power. The output of the VCO connects to the base of an antenna. Figure 1: The Miniature Transmitter (A3001D) cut crudely from the larger circuit board. Note the outline of the actual circuit, and the 75-mm antenna sticking out the side. The Miniature Transmitter allows us to determine the potential range of a battery-powered subcutaneous transmitter, and to estimate the optimal antenna length for such a transmitter when it is immersed in water. To measure the power transmitted by our Miniature Transmitter, we used our Downshifting Receiver. You may recall that we noticed we had a problem with the receiver when we measured its sensitivity as a function of intermediate frequencey (see here). We are glad to say that we have now identified this problem and solved it. When we set up the Downshifting Receiver, we noticed that its output jumped up in amplitude when we flexed the circuit board. After some poking around and replacing parts, we discovered that the two 10-nF surface-mount capacitors on the receiver both had cracked end contacts. We replaced the capacitors, the receiver sensitivity increased dramatically at the lower intermediate frequencies, as shown in Figures 2 and 3 below. Figure 2: The Downshifting Receiver's sensitivity after replacing two faulty capacitors. Compare to Figure 3 below, which shows the measurement we made before we replaced the capacitors. In both cases, the transmitter and receiver are separated by 20 cm, as shown here. Figure 3: The Downshifting Receiver's sensitivity before replacing two faulty capacitors. In both measurements shown above, the TUNE signal on the Modulating Transmitter sweeps from 0.8 V to 2.4 V. According to the MAX2624 data sheet, the transmitter frequency will sweep from roughly 940 MHz to 1040 MHz. The Downshifting Receiver's TUNE input, meanwhile, is held at 0V by a 50-Ohm BNC terminator plugged into the TUNE input. According to the same data sheet, the receiver's local oscillator (LO) frequency will therefore be close to 875 MHz. We expect the intermediate frequency (IF) to vary between 65 MHz and 165 MHz as we sweep the TUNE input of the Modulating Transmitter from 0.8 V to 1.5 V.
We run the intermediate frequency through a 150-MHz low-pass filter before it enters the oscilloscope, so we expect to see the highest intermediate frequencies attenuated by this filter, and we do indeed see such attenuition in Figure 2. At lower frequencies, we expect the sensitivity to be approximately constant, in accordance with the sensitivity of the antenna. We clipped the receiver antenna back by 3 mm to 72 mm before we took the picture in Figure 2, and when we did so, the sensitivity of the receiver dropped slightly at lower frequencies, and rose slightly at higher frequencies, as we would expect, because a shorter antenna is more sensitive to shorter wavelengths. We conclude that our previous measurement, shown in Figure 3, showed high intermediate frequencies travelling across two faulty capacitors, while lower intermediate frequencies were blocked. The sensitivity at the higher intermediate frequency has remained approximately the same after we replaced the capacitors, but the sensitivity at lower intermediate frequencies has risen dramatically until it is equal to that of the higher frequencies. We are now much more comfortable with our Downshifting Receiver, and our Modulating Transmitter. They both appear to perform well across a 100-MHz range of carrier frequencies, from 940 MHz to 1040 MHz, whic is what they were both designed to do. We note that with the antennas tuned to the middle of this frequency range, we get only a ±3 dB variation in power across the entire range. We closed the power connection (R3) on our Miniature Transmitter, and carried it around the room with its antenna oriented the same way as that of our Downshifting Receiver. This orientation proved to be the most favorable for transmission. Our oscilloscope input amplitude varied with range as shown in the following table. Table 1: Intermediate Frequency from Downshifting Receiver at Various Ranges. We show the amplitude of the signal entering the oscilloscope, and the corresponding power received by the receiver antenna. The Miniature Transmitter antenna is pointing straight up, like the Modulating Receiver antenna. As we argue in our Downshifting Receiver report, we are confident that we can receive data signals from the transmitter despite interference and noise, provided the power received is greater than a hundred picowatts or so. Here we see that we are receiving more 30 nW at a range of 5 m, provided the transmitter antenna is favorably oriented. The power received from the transmitter is a strong function of the orientations of the transmitting antenna. We held the transmitter 3 m from the receiver and changed its orientation at random forty times, while watching the received intermediate frequency amplitude on our oscilloscope. In thirty-eight of these forty orientations, the received amplitude was between 5 mV and 14 mV, which corresponds to received power between 30 nW and 200 nW. But in two orientations, the received amplitude was only 2 mW, which corresponds to received power 5 nW. When we tried our best to reduce the received power by rotating the transmitter and watching the oscilloscope display, we found that in a particular orientations, so particular that it was hard for us to hold the transmitter steady enough to make our observation, the received amplitude dropped down to 300 μV. When we disconnected battery power in our transmitter, the background noise in our oscilloscope signal was also 300 μV. These precisely unfavorable orientations reduce the received power at range 3 m to below 100 pW from a maximum of 200 nW. We also made a loop antenna for the Miniature Transmitter. The maximum and average power transmitted by this antenna was less than that transmitted by the straight-wire antenna, and the minimum power was less than 100 pW, just as it was for the straight-wire antenna. The subcutaneous transmitter we hope to build will operate beneath the skin of a rat. As we mention in our Modulating Transmitter report, the dialectric constant of fresh water is 80, and that of salt water is 81 (source). The dielectric constant of a mammal's body is presumably close to 80 as well. Electromagnetic waves travel more slowly through a medium with higher dielectric constant, provided the permeability of the medium remains the same. Because water is non-magnetic, its permeability is roughly the same as that of air. The propagation speed of waves is inversely proportional to the square root of the dielectric constant. If we immerse our Miniature Transmitter in water, we expect the wavelength of our 1 GHz transmission frequency to decrease from 30 cm to 3.4 cm. A quarter-wave antenna in water would be roughly 8 mm long. If the antenna is at the edge of a body of water, such as it would be if it were placed just under the skin of a rat, or just inside the wall of a glass beaker as shown in Figure 3, then we can expect the quarter-wave antenna to be slightly longer than 8 mm. Figure 3: The Miniature Transmitter Wrapped in Latex and Immersed in Water. The transmitter rests against the inside surface of the glass beaker, in an effort to approximate the effect of placing the transmitter under the skin of a rat. The photograph shows the miniature tansmitter with a 15-mm antenna sticking up. We cut the top edge of the circuit board back down as close as we could to the base of the antenna, so that all but a couple of millimeters of the antenna juts out from the circuit board. We began with a 75-mm antenna, and compared the power we received at a range of 1 m with the tranmsitter immersed in water, and standing in air. We then cut back the antenna in steps to its final value of 15 mm, and repeated the same power measurements. Table 2: Received Power for Various Antenna Lengths, both in Air and Water. The Miniature Transmitter is 1 m from the Modulating Transmitter. With a 17-mm antenna immersed in water, we receive half as much power through the wall of the beaker as we receive with a 75-mm antenna standing in air. Whe we move the transmitter to the other side of the beaker, the received amplitude varies by a factor of two, but no more than that. We always receive at least 50 nW from the beaker at range 1 m, provided the transmitting antenna is pointing straight up. According to Jeffries et al., the electromagnetic wave radiated from our transmitting antenna will lose 4 dB of power from reflection at the water-air surface, and 1 dB per centimeter of water it has to pass through. Here we see a 6-dB loss as a result of re-tuning the antenna and immersing the transmitter in water. When we orient the Miniature Transmitter at random at range 3 m, we find that we receive between 30 nW and 200 nW in 95% of the orientations, and between 5 nW and 30 nW in the remaining 5% of orientations. If we deliberately seek out the precise orientation of the transmitter at which the received power reaches a minimum, we find that we can reduce the received power at range 3 m to below 100 pW. Our loss due to orientation is almost always less than 15 dB, but it is possible for the loss to be greater than 30 dB. When we immerse our transmitter in water, we find that we must reduce the antenna length from 75 mm to 17 mm in order to maximise our received power. When we place the transmitter on the far side of a beaker of water, we receive at least 50 nW at range 1 m, as compared to 500 nW when the transmitter is standing in air at the same range. Our loss due to immersion in the beaker is never greater than 10 dB. When we combine the near-certain 15 dB limit to loss from unfavorable orientation to the 10 dB limit to loss from insertion in water, we see that we are almost always sure to receive more than 500 pW from within the body of a rat three meters from our simple receiver circuit. With a more efficient antenna, we will receive at ten times as much power, or 5 nW. It is possible, however, that the rat will fall asleep with the transmitter in one of the precise orientations, which we will call dead orientations, that leads to more than a 30 dB reduction in received power. When this happens, our received power at range 3 m might drop below 100 pW, and we might fail to receive data transmissions from the rat when we are in the presence of cordless phone interference. We see three solutions to the problem of dead orientations. One is that the larger antenna we buy to incrrease our receiver sensitivity will eliminate the dead orientations because of the large angle its length subtends at a transmitter only three meters distant. Another is to place two receiving antennas in the same room, at different locations and orienations. Both receivers will record all the data they receive, and the data acquisition software will combine the data acquired by the two receivers into one complete data record without sample duplicates. A third solution is to create a combination helix and linear antenna for the transmitter that compromises maximum transmission efficiency in order to raise its minimum transmission efficiencey. We tried a simple loop antenna, but this offered no improvement. With positive proof of the reduction in length of the transmitting antenna in water, we are more confident than ever of the success of the Subcutaneous Transmitter project. Our only serious technical issue are the dead orienations, but believe we have at least one sure answer to this problem: place two receivers in the lab to make sure we always receive every transmission with at least one receiver.